Chat bots, the automated and sometimes smart contextual messaging systems, are all the rage, fresh off the heels of Facebook’s annual developer conference and the release of Kik’s bot platform. Think piece after think piece is trumpeting chat bots as the future of commerce and the next great user interface. With the conversation around chat bots at a hyperbolic level, it’s important to figure out what chat bots will actually be good for. What follows is a framework for thinking about chat interfaces and chat bots in the fashion industry. As you will see, a skeptical and contrarian approach is the best way to unlock the value of these new platforms. The current dialogue around chat bots is best summed up as lots of yelling that chat bots will replace every user interface before it. This is silly, and fails to ask a key question: how can chat bots add actual value for the customer? Do not ask me 10 text based q’s I could have opened an app and gotten done in 1 screen. If you’re making the experience worse, you’re doing it wrong. Hence: are you solving discovery, or just moving it, and substituting a different gatekeeper? And if you’re just rearranging the deck chairs you’re also not unlocking the potential of chat bots. The best way to understand new products, such as chat bots, is to consider them as an addition to your toolkit, not a substitute. More specifically, looking at chat bots through the conversion funnel helps narrow the use cases. Using this excellent infographic from Ben Thompson, which I also referenced to explain why buy buttons failed, I’m guessing that chat bots will be most effective for Awareness and Consideration, but not Conversion. The best chat interfaces will have a hybrid approach, using chat bots for programmable communication and then following up and reinforcing it with human to human conversations. Let’s start by looking at discovery and service, two pillars of commerce, through the lens of the funnel. As I wrote in Push vs pull: helping customers discover the right products, helping customers find the right products is largely unsolved, and only worsening as brands create more and more products. Although newsletters in their current form aren’t converting optimally, there’s a lot to learn and implement by following the same passive framework. Supreme, for example, sends a push notification through their app every Thursday when new products drop. This passive notification turns a customer into an active shopper very quickly. It works because the notification is targeted and Supreme knows that customers with their app are diehard fans. I’m not privy to any real numbers but I would guess this single notification has done wonders to their conversion rates. Conversely, I used to get a daily newsletter of new arrivals from Farfetch. Even though the passive method had potential, the offerings within the newsletter were way too broad. First, Farfetch didn’t know my gender, and was spending half of the email telling me about women’s clothes. Next, they had no idea what brands I liked or what price point I shopped at. Finally, Farfetch was sending so many options it was overwhelming and unhelpful. I eventually unsubscribed. Newsletters and push notifications will logically evolve into chat bots, but with added intelligence. The newsletter should progress into more personalized messages, highlighting the right products for the right person. This would improve discovery. Brands with excellent data operations can start building a new layer of notifications with chat bots serving the top of the funnel, helping propel the Awareness layer. Chat bots will work for more broad, programmatic notifications that spark interest. First, and most importantly, no two people should see the same storefront or have the same browsing experience. Instead, a site should make a bunch of inferences from a consumer’s purchase history about what she likes and what she might be open to. Showing her anything (or everything) is ineffective, as is sorting it by chronology or brand. Search and categories should still exist, in case she knows exactly what she’s looking for, but they should be a secondary interface, not the primary one she shops with. The same goes for the endless inventory. If a retailer is big enough to support a ton of options and variations, it can still have the inventory. But instead of stacking it up under pagination that goes dozens of pages deep, figure out how to show a dozen items to the right person. To push this even further, conversational commerce probably should replace the storefront altogether, leading to a happy combination of Active and Passive shopping. Bundled with a sophisticated recommendation engine, brands should text a consumer a dozen or so products every week that she would be interested in. Brands now own the relationship with the customer and have a direct line to the device she spends the most time on: her phone. This fixes all of the issues with Passive shopping and distribution, since the open rates on texts and push notifications are infinitely higher than mass emails and retargeted ads. This vastly reshapes customer acquisition and marketing, and a fair amount of the paid spend could be reallocated towards moving current inventory and increasing the lifetime value of current and new customers. The “tyranny of choice” is only increasing. Now that almost everything is available online, we’re now swinging back towards curation. Chat interfaces might be a big part of the puzzle. (Evans’ full piece, Lists are the new search, is worth a read). Just as Slack is more natural than sending a rigid email, chat interfaces will lead to more fluidity between the brand and the customer. When used respectfully, this could be beneficial to both parties. Customers don’t like getting irrelevant emails. But getting the right products at the right time is valuable in a less formal and threatening format. Moving down the funnel to Consideration, we’ll see a hybrid approach between chat bots and chat messages with humans. There won’t be an explicit line, but a constant volley between the two approaches. Below is an example user flow between a user, a chat bot and a sales associate plugged into the chat platform. It’s crucial to understand and consider the interplay between the sales associate and the bot. This is not an all or nothing approach. 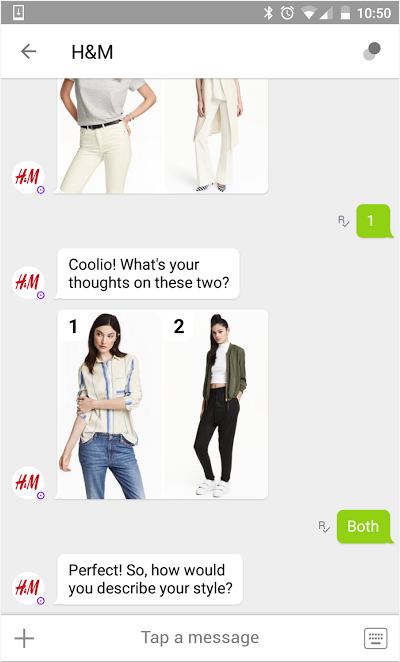 Early experiments that take a full-bot approach that are only focused on conversion, like one from H&M, are rigid and unsatisfying for three obvious reasons: talking to a robot is 1) far from perfect; 2) very slow; and 3) you can’t just yell “buy this!!!! !” at a customer—the funnel exists for a reason. Yes, artificial intelligence will improve the first two problems, but that is not a solution for bad design nor will this happen today. Architecting chat bots for the right use cases is a key way to work around the lack of AI and make chat bots useful. Ignoring the funnel will lead to poor results. This hybrid approach will also add an immense amount of value to customer service. A direct line to a brand’s customer service team is a simple yet powerful feature. No more tracking down phone numbers, dealing with phone banks and time-wasting customer service issues. Just send a message to the customer service team and someone will be in touch shortly. The customer service rep will also know about your orders and what products you’ve looked at so he can be more helpful. Again, this will be a hybrid approach. Bot messages, such as order and shipping confirmation notices, will exist in the same channel as human conversation. Everlane has a really nice implementation on the bot side, which sends order updates via Facebook Messenger. The next step is to add a line to customer service so customers just have to go to one one centralized place for everything. With search inside this channel, the days of searching for disparate emails and receipts will slowly, and happily end. I’m very bullish on using chat interfaces as direct lines to customer service, more so than chat bots themselves. Why? Because it’s adding value and solving a real pain point. That’s the actual goal.